Jews and their friends everywhere marked the 60th anniversary of the founding of the State of Israel on May 7. Israel has become a home to Jews from Europe, the former Soviet Union, the Middle East and Africa. There they find dignity, identity, freedom and, in many cases, prosperity. In four wars Israel has triumphed over its enemies. Despite the costs of a vast security establishment, it has built a vibrant economy, and its alliance with the United States is unshaken. Zionism may be the most successful nationalist movement of the 20th century. Israel, however, has yet to answer the question of its founding: Can it be both a Jewish state and a democratic one? While the young nation is routinely called “the only working democracy in the Middle East,” it is not a liberal democracy in the Western sense, in which minority rights are honored. 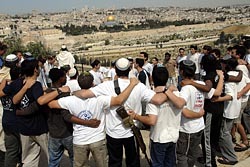 Arab Israelis, a fifth of the population, are treated as second-class citizens. Since a landmark official study five years ago, there has been no improvement in the systematic discrimination against them. More worrisome still is the growing desire of the Israeli public to reduce the number of Arabs in their midst. A decade ago proposals for “transfer,” that is, expulsion, of the Arab population, were regarded as morally repugnant. Recent polls indicate it is favored by a majority of Israeli Jews. As history moves ahead, the test of Israeli maturity will be whether it fully integrates the Arab minority into the life of the country. When Israel turns 70, it will have succeeded if it has become not only a Jewish homeland but also a state with equal rights for all. The letter of 138 Muslim scholars, “A Common Word,” addressed to Pope Benedict XVI and other religious leaders in October 2007, has been welcomed as a positive step in the process of Christian-Muslim dialogue. On May 6, Christian Troll, S.J., one of the foremost Catholic scholars of Islam and a professor at Kolleg Sankt Georgen in Frankfurt, Germany, presented a commentary on the letter at the Gregorian University in Rome and offered an analysis of the progress of the dialogue. Father Troll was joined by a Jesuit colleague from Cairo, Christiaan van Nispen, also a professor of Islamic studies. Father Troll praised those in many parts of the world who are engaged in serious dialogue and cooperative projects. This Christian-Muslim dialogue, he added, will be a long-term effort, requiring good will, prayer and much patience. At thousands of college and university campuses across the United States this month, a familiar ritual will be re-enacted. Graduates will be saluted, congratulated, warned and exhorted by commencement speakers, paid and unpaid, who have been selected for their achievements, prominence or even notoriety. Television personalities seem to be in fashion in this current graduation season; Tim Russert and Chris Matthews are said to be competing in the number of honorary doctorates they have collected for such services. In 1982, the Irish poet Seamus Heaney spoke at a Fordham University commencement and wrote a poem for the occasion. After Mr. Heaney won the Nobel Prize in Literature in 1995, he received many similar invitations, but always declined the suggestion that he compose another original poem to celebrate the event. That singular day in 1982 had been threatened by inclement weather, but wise heads at Fordham had moved the ceremonies indoors. Outdoor commencements, with the danger of overcast skies and possible showers, always pose a challenge to a commencement speaker. On one such occasion, when a light drizzle at the start of the ceremony progressed to a steady rainfall, the commencement speaker doggedly stuck to a rather lengthy text, his only concession to the weather a somewhat accelerated delivery. The graduates sat in polite silence until the speaker reached the last page of his manuscript. When he announced, “In conclusion,” the graduates immediately burst into applause, to the consternation of the speaker and the embarrassment of his host, the university president. Not only Israel at 60, but also the Nakba (in Arabic, the Catastrophe) at 60, the 60 years since the expulsion of 750,000 Palestinians from their homes and villages in Palestine. The continuing illegal occupation by Israel of the West Bank, Gaza, and East Jerusalem--an occupation of military checkpoints, house demolitions, land confiscation, collective punishment, an Apartheid wall of separation, indiscriminte missile attacks--is witness that democracy is no guarantee of justice and morality. The tragedy in Gaza where a million a half human beings are crowded into eight refugee camps in 90 degree heat without water or electricity, with scarce food and medicine, is the work of Israel at 60 and not something we should be celebrating. Shame on Israel, and shame on the U.S. government that supplies it with economic support and arms. When I read "Israel at 60" I had the feeling that there was an "elephant in the room" that was not being noticed. You make a fine case for the lack of equality for Arab Israelis. But how is it possible to speak about Israel in 1948 without mentioning the 750,000 Palestinian Arabs who lost their homes and property and became refugees. Pope Benedict XVI (quoted under the Signs of the Times)gracefully offered his best wishes to Israel and added that the Holy See "hopes soon to see a time of even greater rejoicing when a just peace finally resolves the conflict with the Palestinians." Only when everyone acknowledges the whole story of 1948 will there be a possibility of peace. This article also appeared in print, under the headline "Current Comment," in the May 26, 2008 issue.